When you have kids, life can get very busy. I feel like we are always rushing to get somewhere or do something. I sometimes need to remind myself of the importance of slowing down and taking the time to appreciate my boys (while they are still young). So today, instead of doing laundry, I baked a cake for my 7 year old's stuffed dog. It seems like a silly thing to do, right? 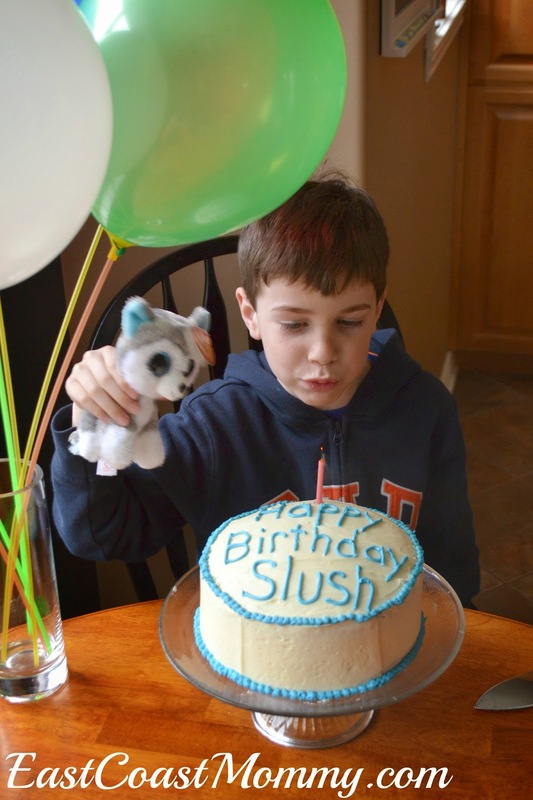 But on the way out the door this morning, my 7 year old told me that today was "Slush's" birthday. He told me this information as though it was very important news... and to him, it was. So, after I got my boys off to school, I blew up some balloons and baked a cake. And after supper, we sang, "Happy Birthday", and "Slush" blew out his candle. I know my boys will only be little for a short time, so sometimes it is necessary to let the laundry pile up and have a birthday party for a stuffie. 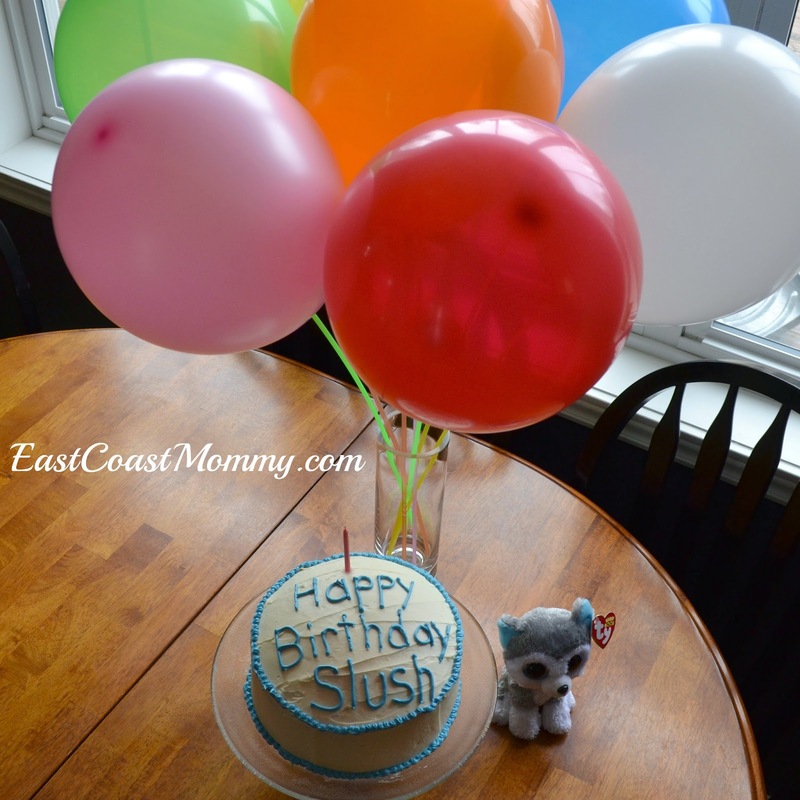 Happy Birthday, Slush! There is still a little snow on the ground, but my boys are ready for Spring aka "bike season". I love seeing my boys outside and active but, of course, their safety is always my number one priority. 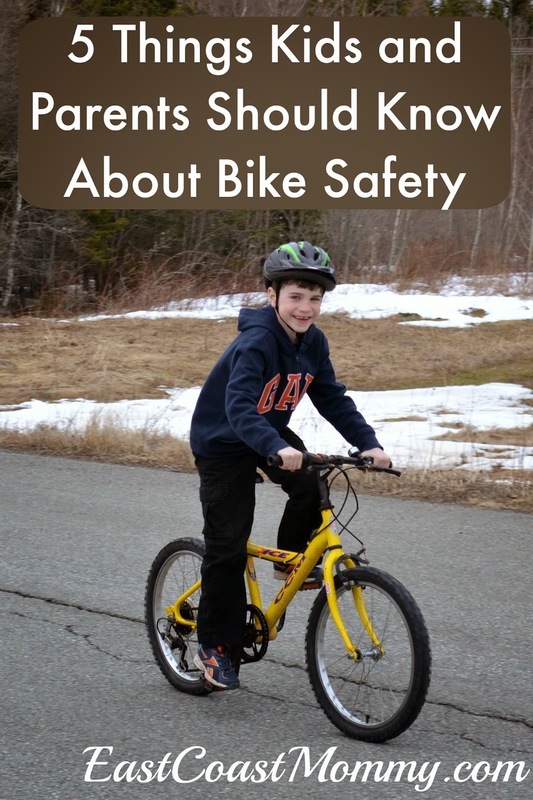 Today I am sharing 5 important things that every child and parent should know about bike safety. 1) Wear a helmet - My boys all have helmets (that fit properly), and they know that they are not allowed on their bikes without wearing them. Head injuries are the number one cause of serious injury to kids on bicycles, and wearing a properly fitted and correctly worn bike helmet can cut the risk of serious head injury by up to 80%. Wearing a helmet is a must for kids! 2) Ride a safe bike - Make sure the bike is in good working order and fits the child. You'll also want to make sure the tires are inflated and the brakes are working properly. 3) Wear proper footwear - My boys know that they must wear sneakers or their closed-toed sandals when they ride their bikes. Flip flops are not proper footwear for bike riding. 4) Know the rules - If kids are going to be riding their bikes on roads, they should be taught bicycle safety and rules of the road. All riders should use appropriate hand signals and respect traffic signals. My boys know that they must stay on the side of the road, watch for cars, and always stay together. It is important for me to know that if someone gets injured, there will be someone to go for help. 5) Pick safe routes - Make sure kids know where they are allowed to ride their bikes. The routes should be safe and appropriate for the age of the child. These five tips are important, but you can find even more information on safe cycling at Parachute here. What's your best bike safety tip? Disclosure: I was compensated by Parachute for my participation in the #safekidsweek campaign, but (as always) the opinions expressed in this blog are 100% my own. 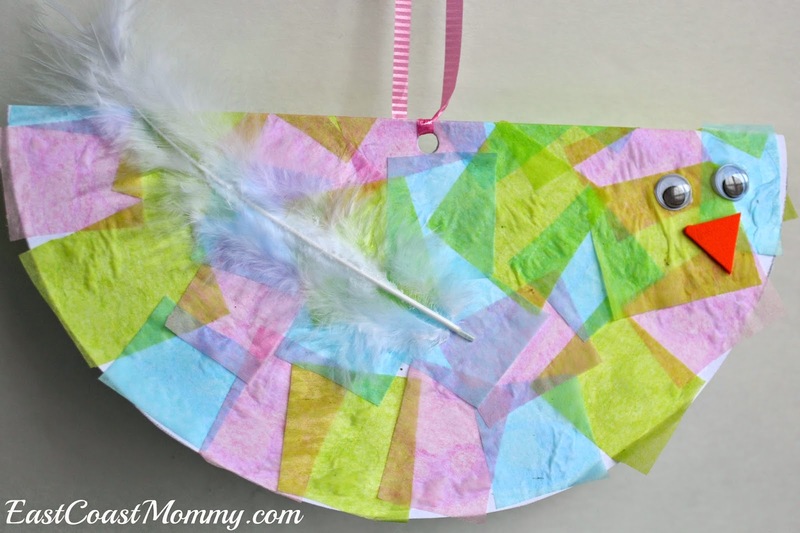 I love the idea of kids making their own gifts for the special people in their lives, don't you? 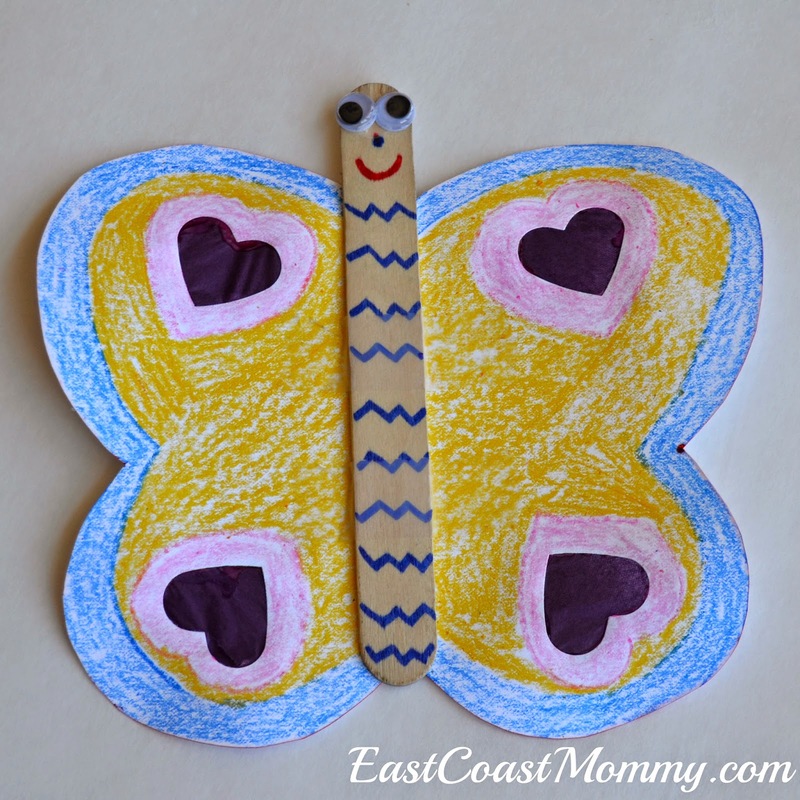 This popsicle stick frame is a perfect DIY gift for Mother's Day, Father's Day, or a special teacher. To make this adorable kid's craft, start by painting four craft sticks in a bright color. Then, glue the ends together and embellish with buttons on the corners. 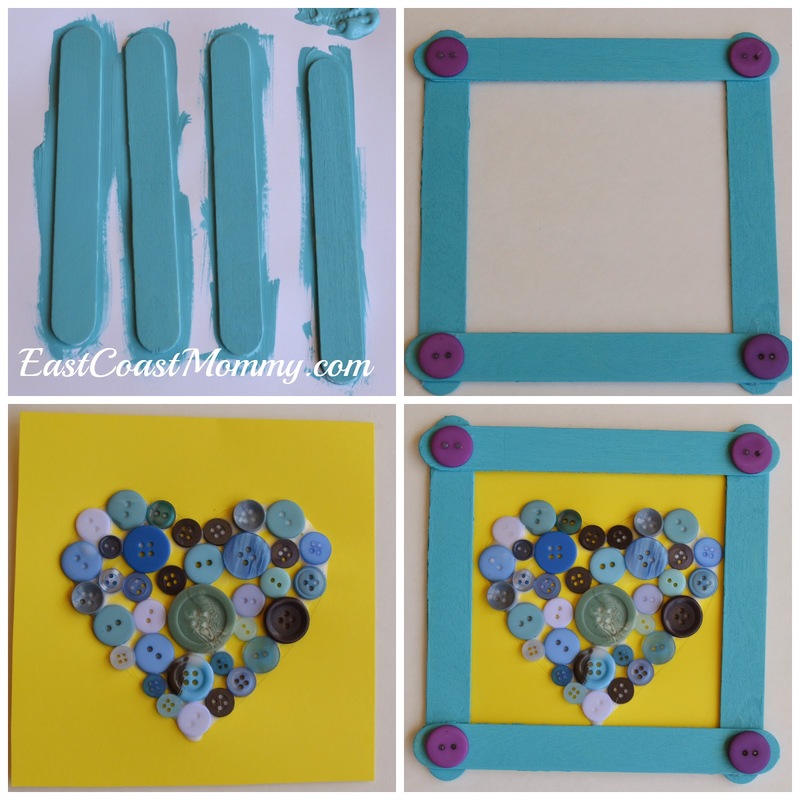 You can fill this frame with a child's drawing, a handprint, a meaningful photo, or this simple button heart. To make the heart, just draw a heart on a piece of card stock and use glue and buttons to fill it. 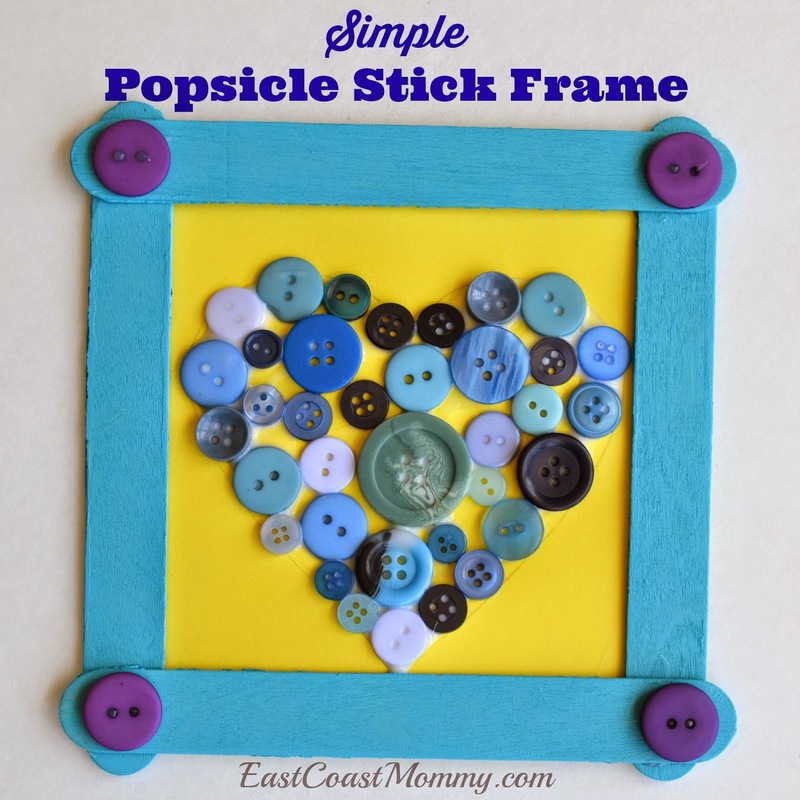 Who would your little one make this popsicle stick frame for? I teach a weekly class for preschoolers called "123 Learn with Me". 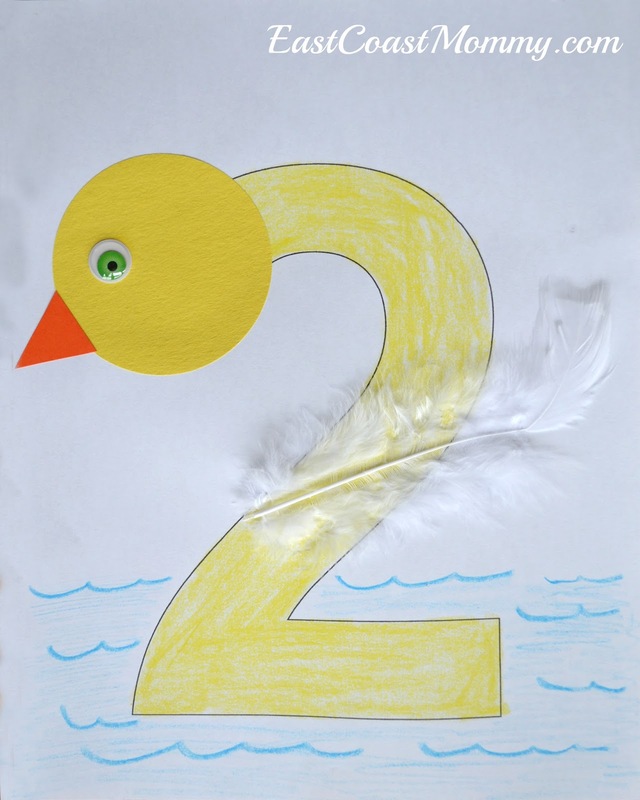 Each week, we learn about numbers through a variety of activities and crafts. 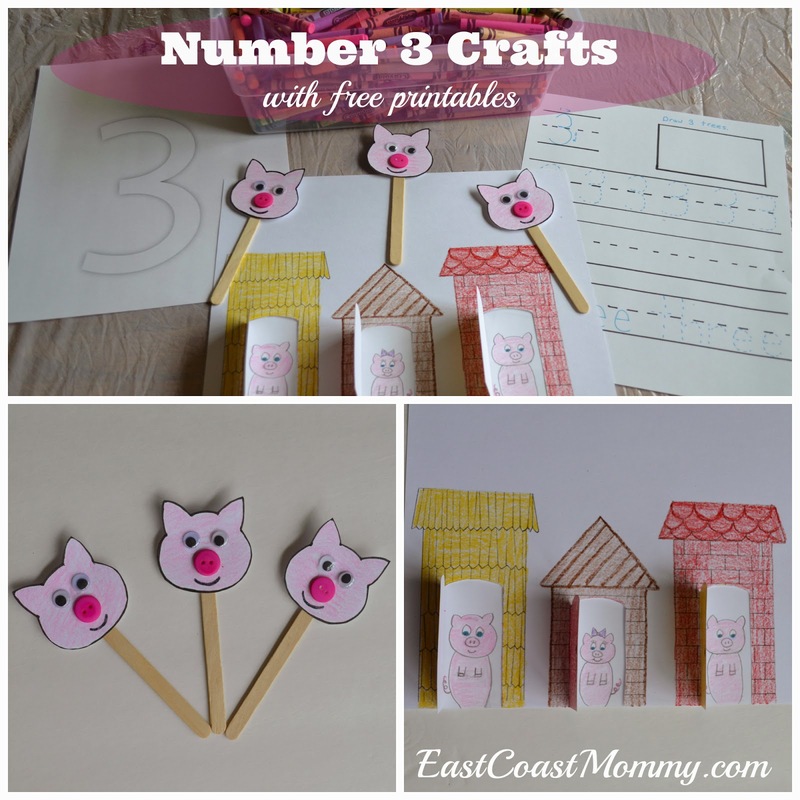 This week, we had some fun learning about the number three by crafting and playing with the three little pigs. 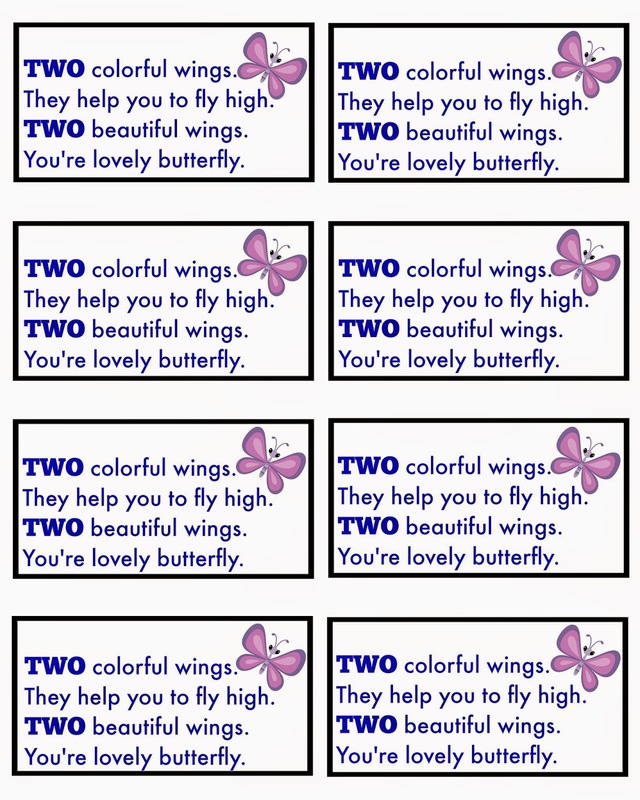 We did some number three printing practice, decorated a number three with stickers, read a story about the three little pigs, and made two crafts. 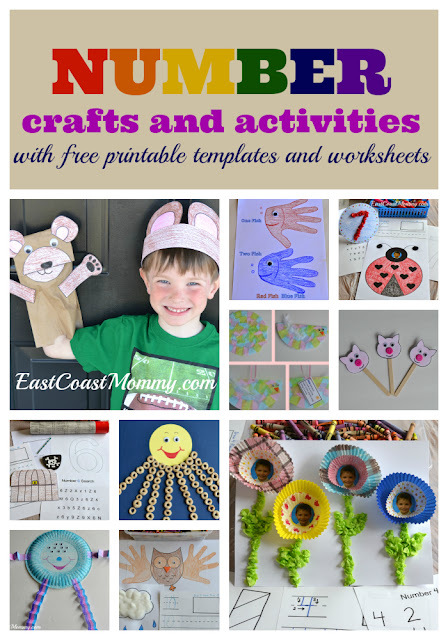 Today I am sharing the tutorials for the crafts (including free printable templates). 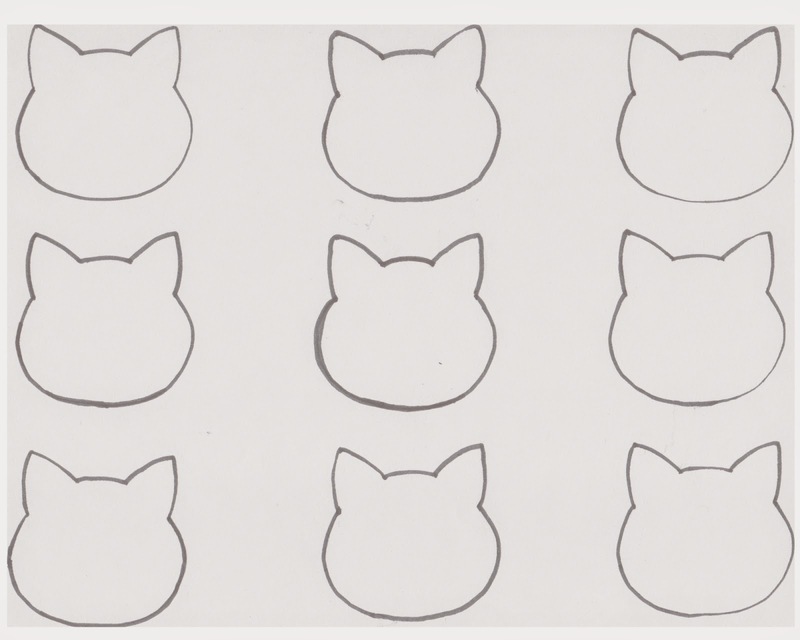 1) Print the template and color the pigs' heads. To download and print the template, you can right click on the picture below, save it to your computer, and print it like a regular 8X10 photo. 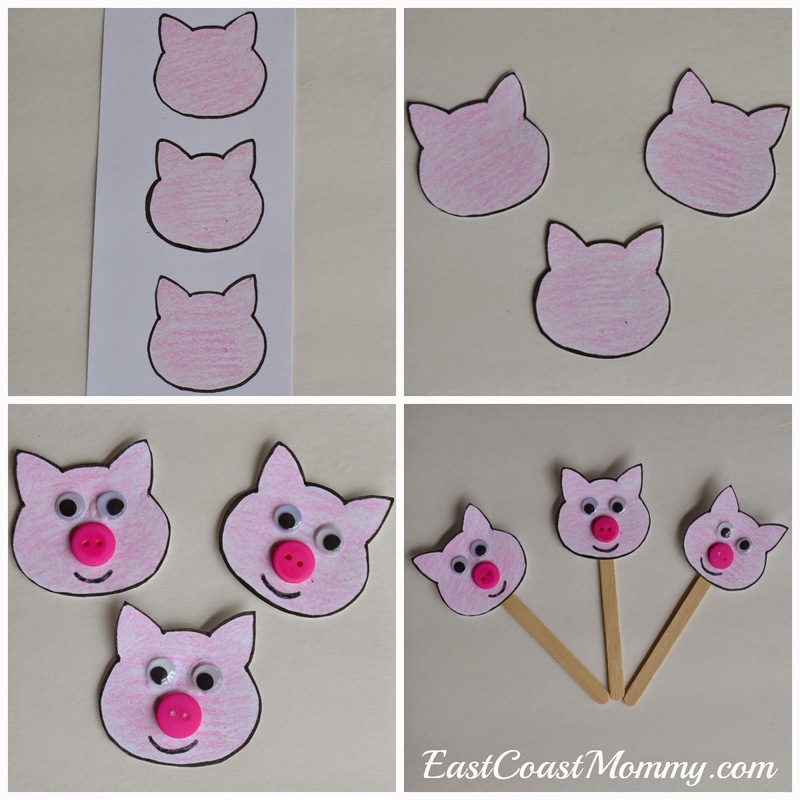 Or you can download a pdf version of the template for the pig puppets here. 2) Cut out the heads. 3) Add googly eyes and a button nose. 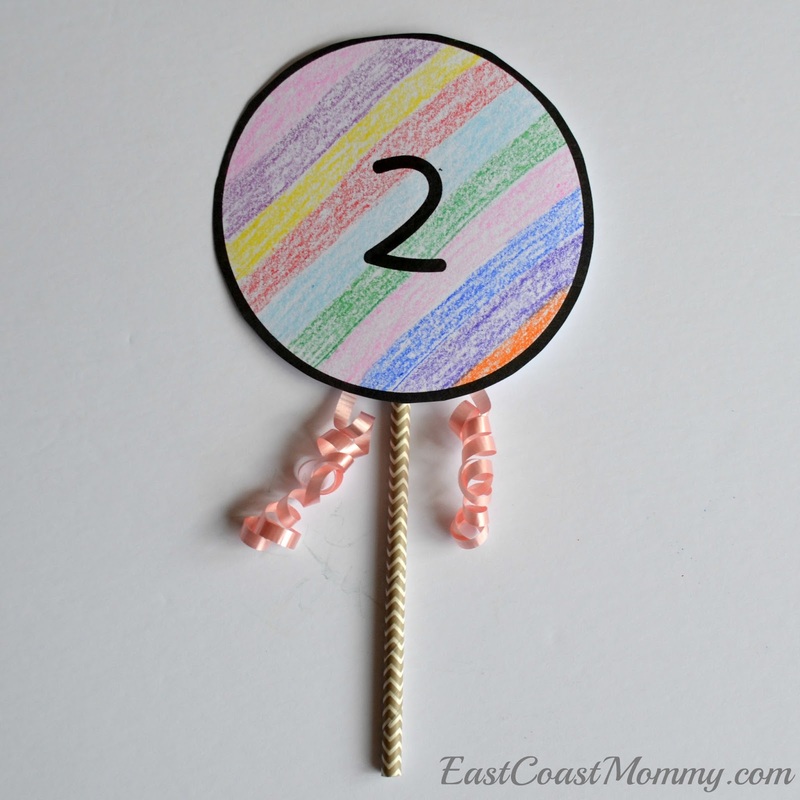 4) Glue or tape a craft stick to the back. 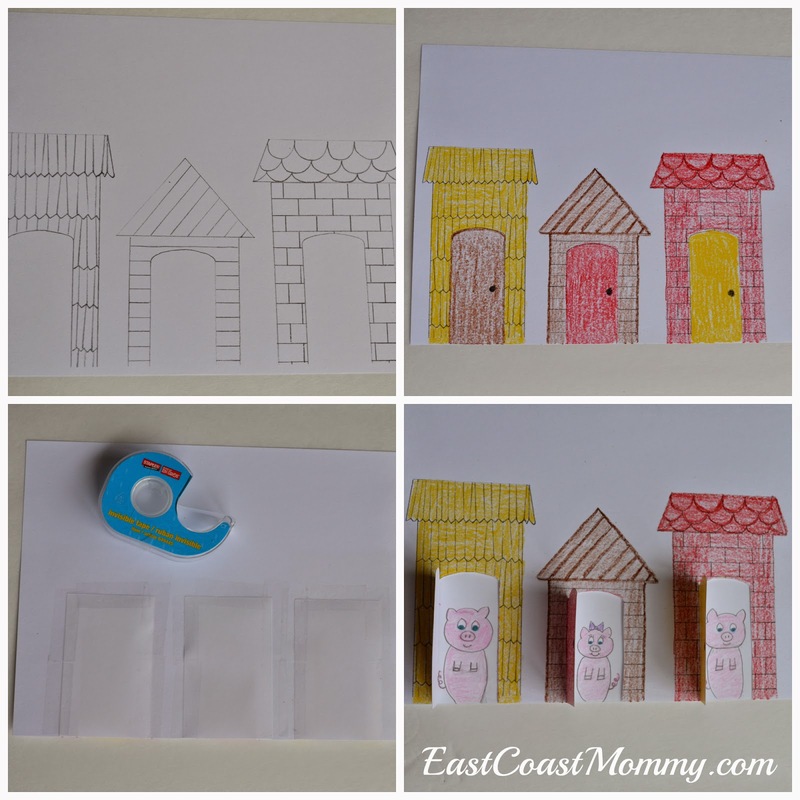 1) Print the template and color the houses. To download and print the template, you can right click on the picture below, save it to your computer, and print it like a regular 8X10 photo. 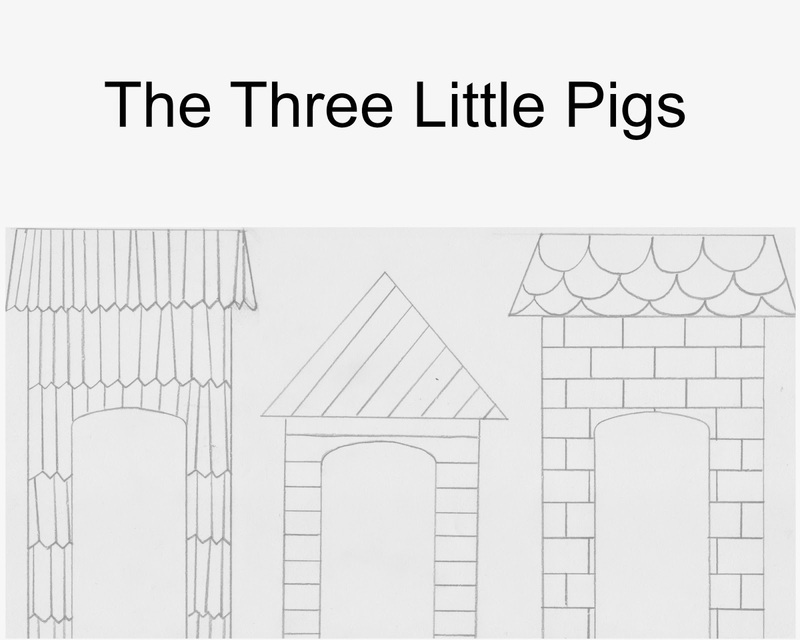 Or you can download a pdf version of the template for the Three Little Pigs houses here. 2) Cut out the doors on one side and the top... leaving one side attached so the door can open. 3) Tape or glue a piece of white paper to the back of each door to cover the openings. 4) Draw pictures of the pigs inside the houses (behind the doors). That's it! 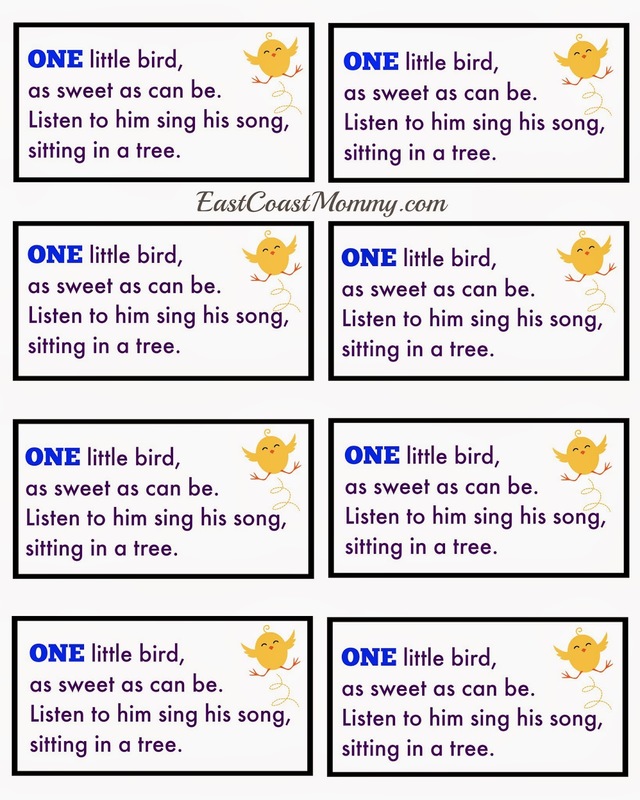 Isn't this a cute way to learn about the number 3? 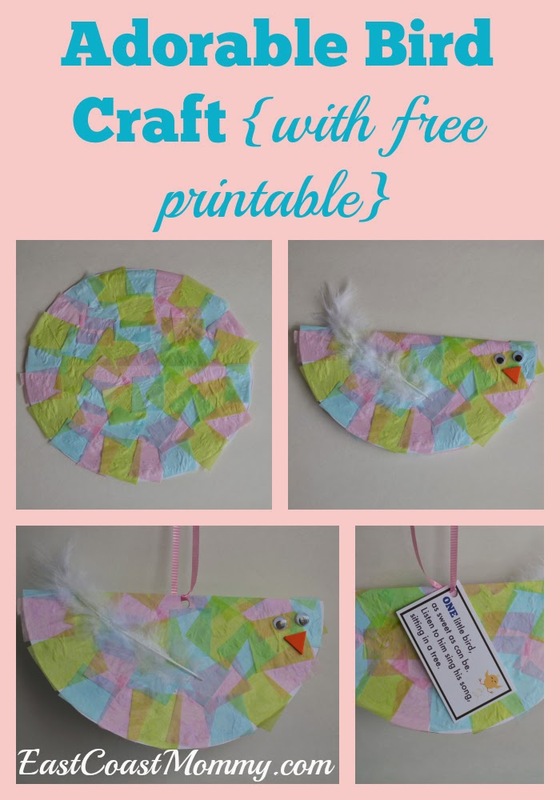 I'll be sharing our crafts and activities for the number 4 soon, so don't forget to come back and check them out. My boys are huge hockey fans, so it was no surprise that my oldest son chose "hockey" as the theme for his 9th birthday party. 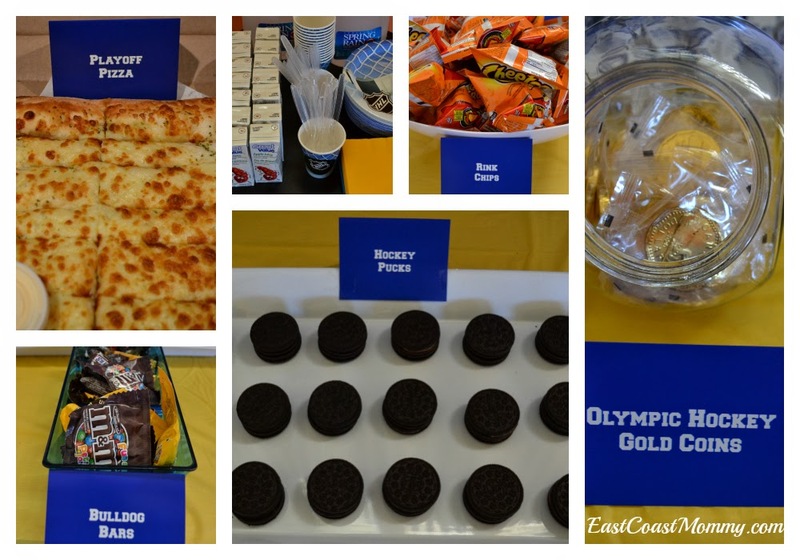 It was a fantastic party, and today I am sharing the fun hockey party food we had at our party "canteen". The food table decor also added to the festivities. 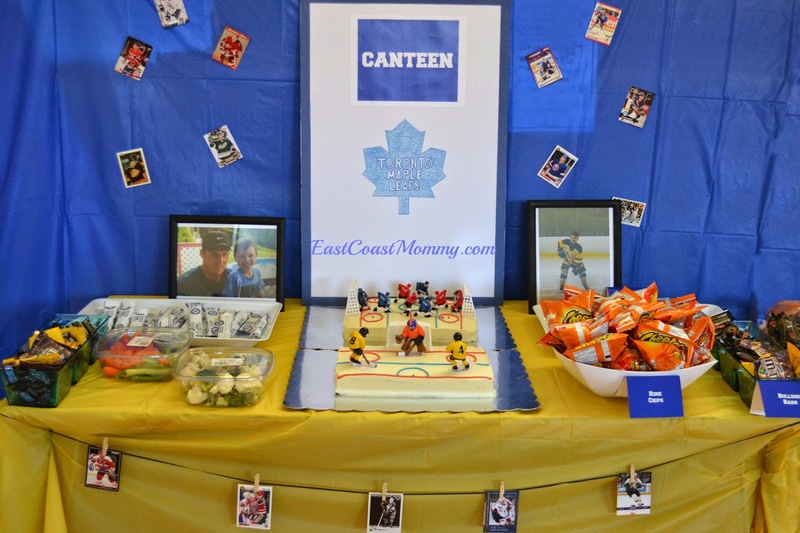 We used a plastic tablecloth for a backdrop and added some hockey cards. I also added a picture of my son playing hockey and one of him with the captain of his favorite team. And, finally, I made a "canteen" sign from a piece of dollar store foam core with hockey tape around the edges. And, of course, the most important food at a party is the cake. 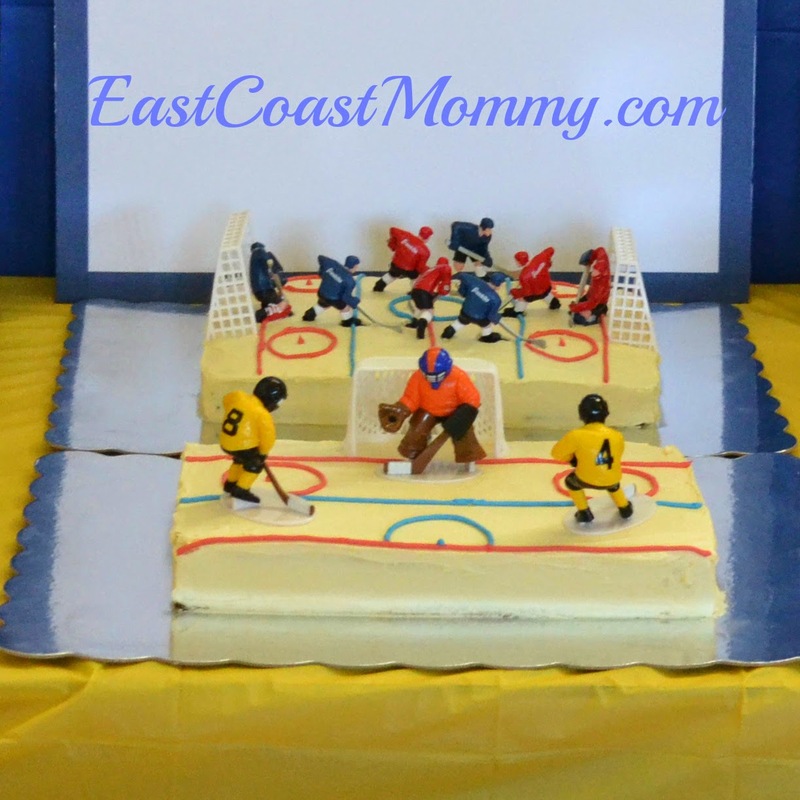 You can find the tutorial for this awesome hockey cake here. 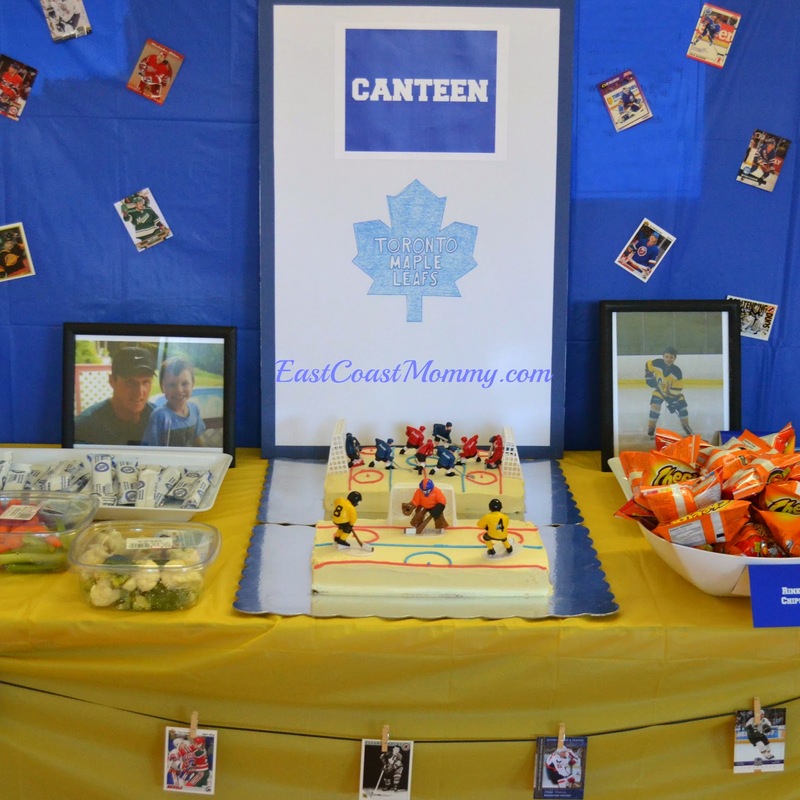 I think this hockey party food is perfect for a hockey birthday, end of season team gathering, or Stanley Cup Final party. Do you have a hockey fan in your home? 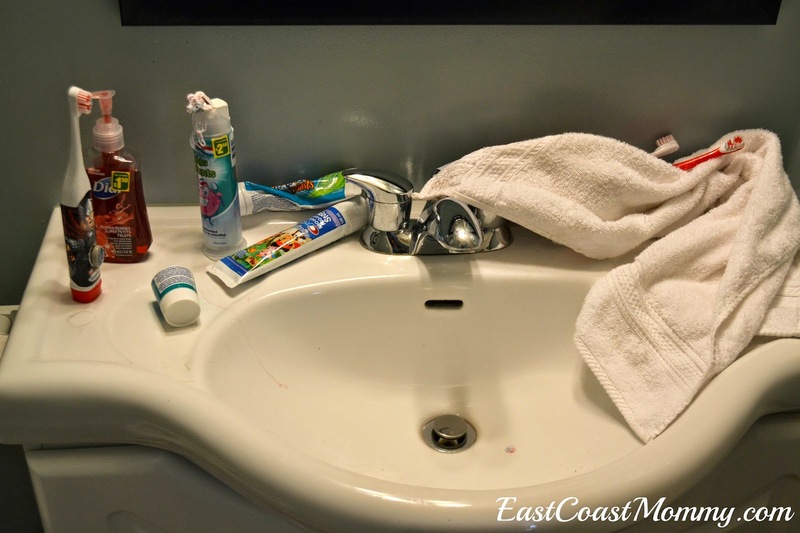 My kids' bathroom has been a disaster for a long time. They have electric toothbrushes that don't fit in traditional toothbrush holders, and they all like different kinds of toothpaste. 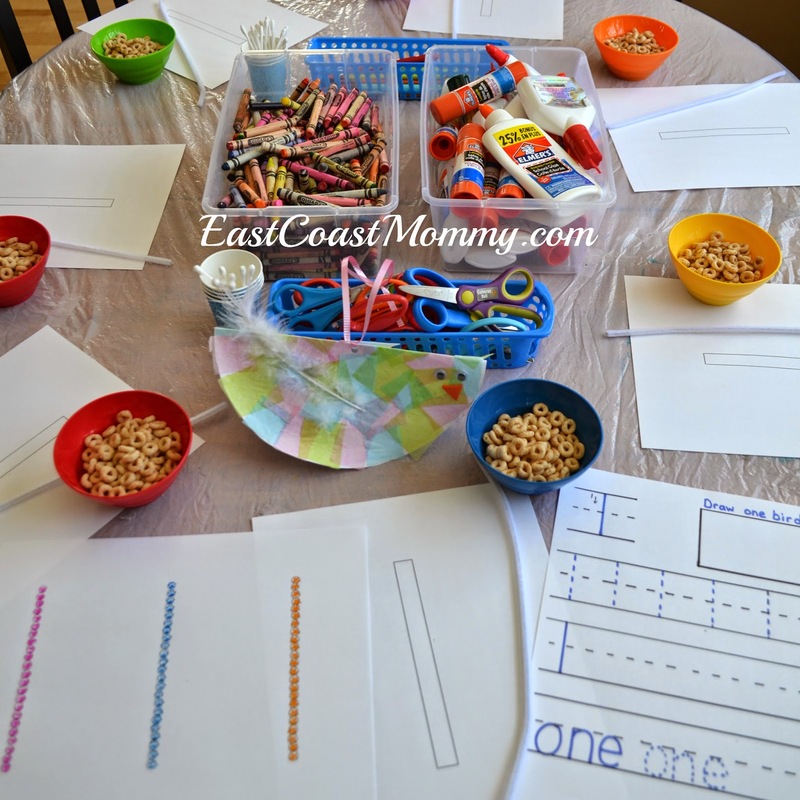 I have been trying to find a way to organize our supplies, and recently, I came across a fantastic solution from "Musings from a Stay at Home Mom". 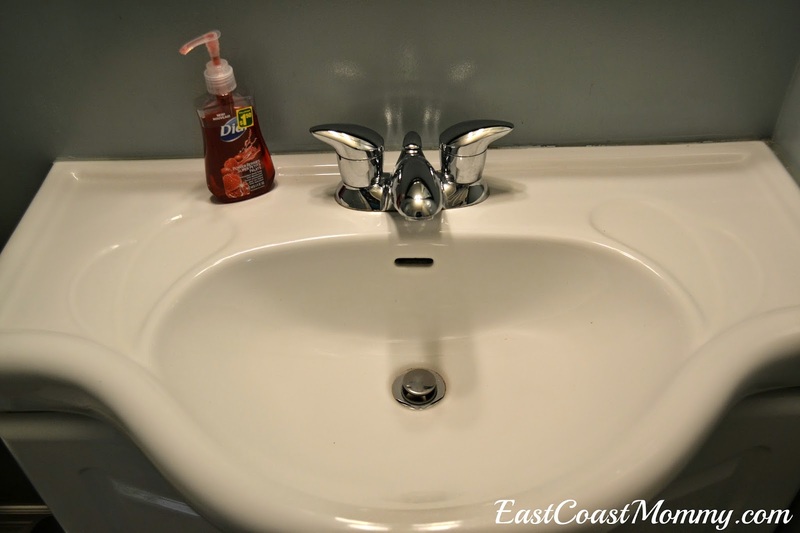 Today, I am sharing my version of her project -- a dollar store toothbrush storage solution. For the record... here is the before picture of my bathroom. I have no drawers in the bathroom, so I used the side of the cabinet door under my sink. All you need for this project is a pair of scissors, some lightweight plastic cups from the dollar store, and velcro strips that are sticky on the back. 1) You'll want to clean the back of cabinet door really well, and allow it to dry completely. 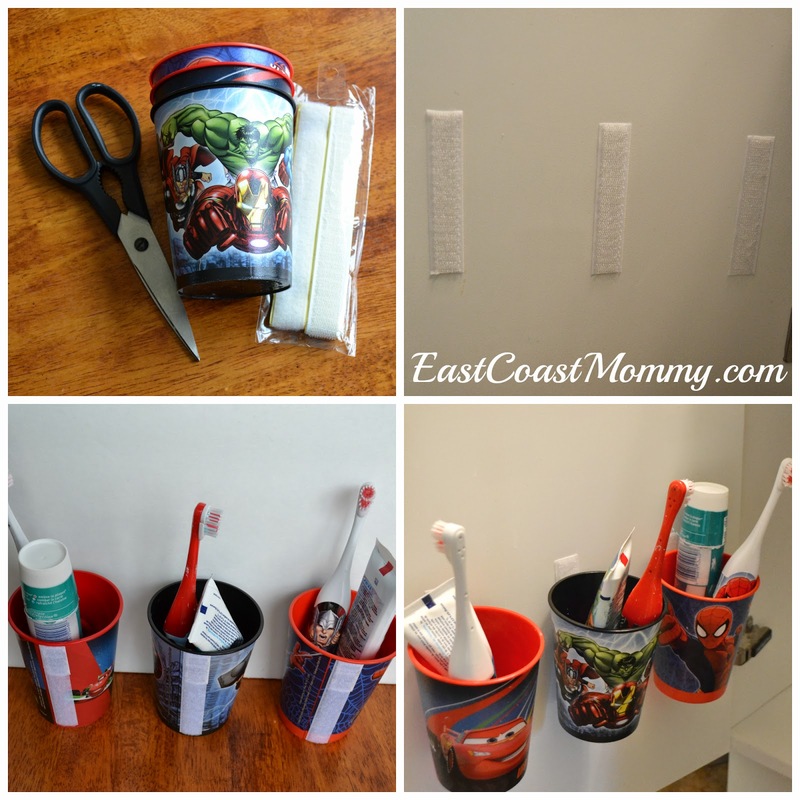 2) Cut the velcro strips to the length of the cups. 3) Attach the "hook" side to the cabinet door. 4) Attach the "loop" side to the cups. That's it! I love how simple this solution is and the fact that I can easily remove the cups for cleaning. 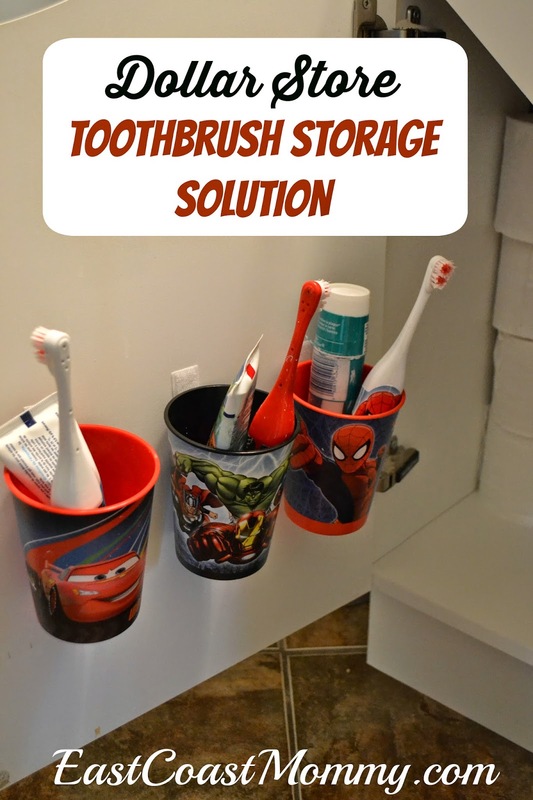 What do you think about this toothbrush storage solution? Do you think it would work in your house? Now I just have to find a way to keep them from splattering toothpaste every time they brush their teeth. Any ideas? 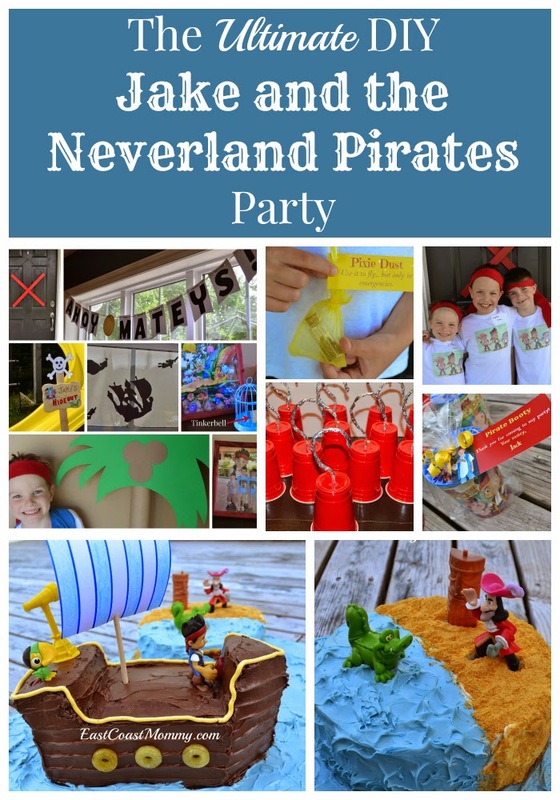 I love a good DIY party, and today I am sharing all the awesome details of my son's 5th "Jake and the Neverland Pirates" birthday party. 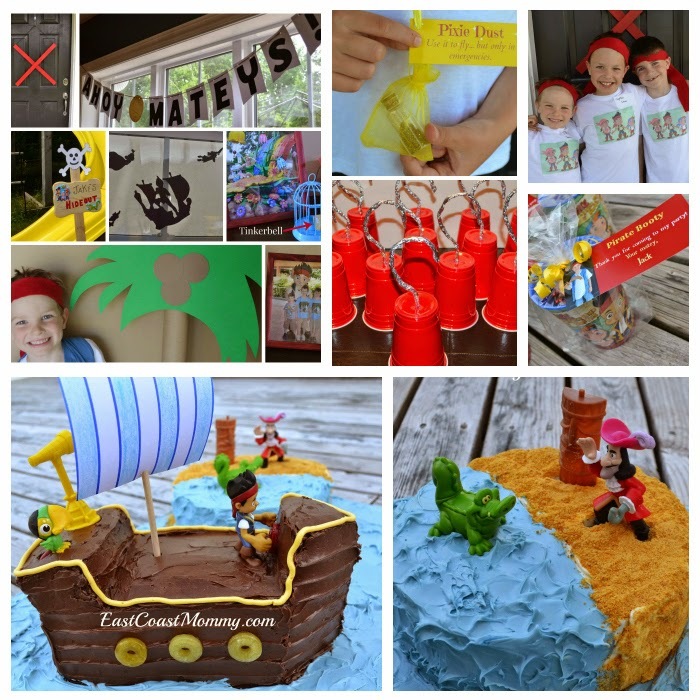 It was a simple party, but the easy and inexpensive special touches made it the ultimate DIY pirate party. 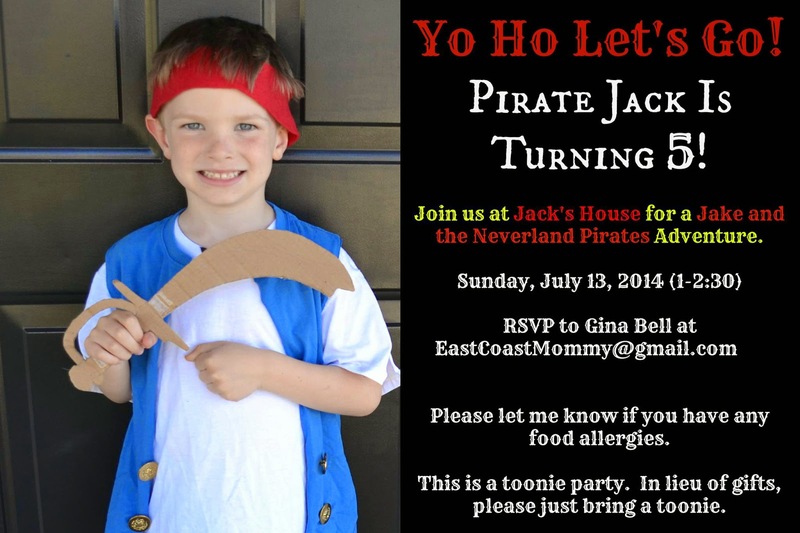 A good invitation always sets the mood for a party, so I took a picture of my little pirate, and I added all the party info using a photo editing software. I used Picmonkey.com because it is free and very user friendly. 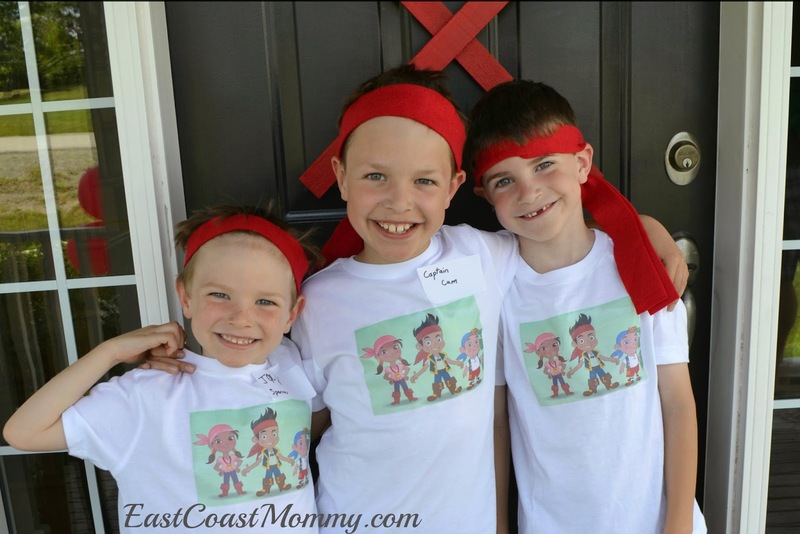 Then, on the day of the party, as the guests arrived, they were greeted at the door by my three little pirates, and they were asked to choose a pirate name. My oldest son wrote out the name tags and stuck them on our guests. 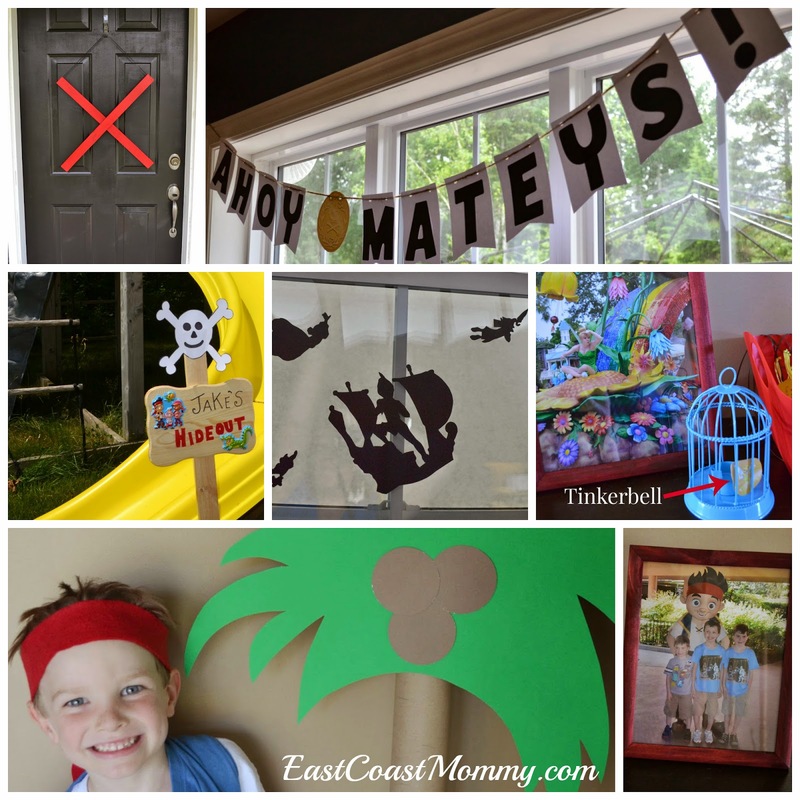 Once inside our home, our guests were transported into a pirate hideaway via a variety of easy DIY pirate party signage and decor. 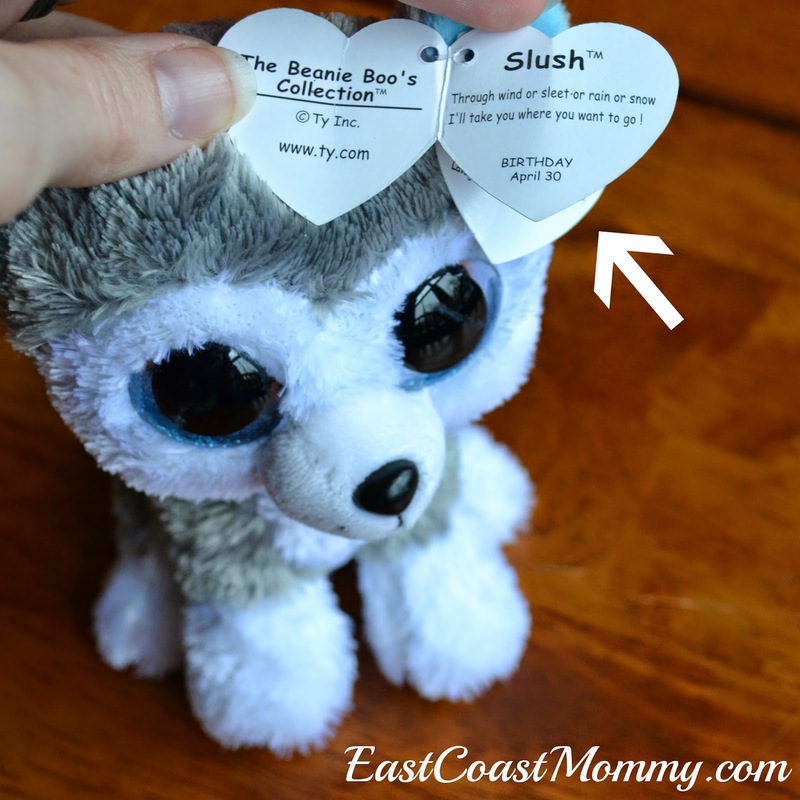 You can find all the adorable details and instructions here. 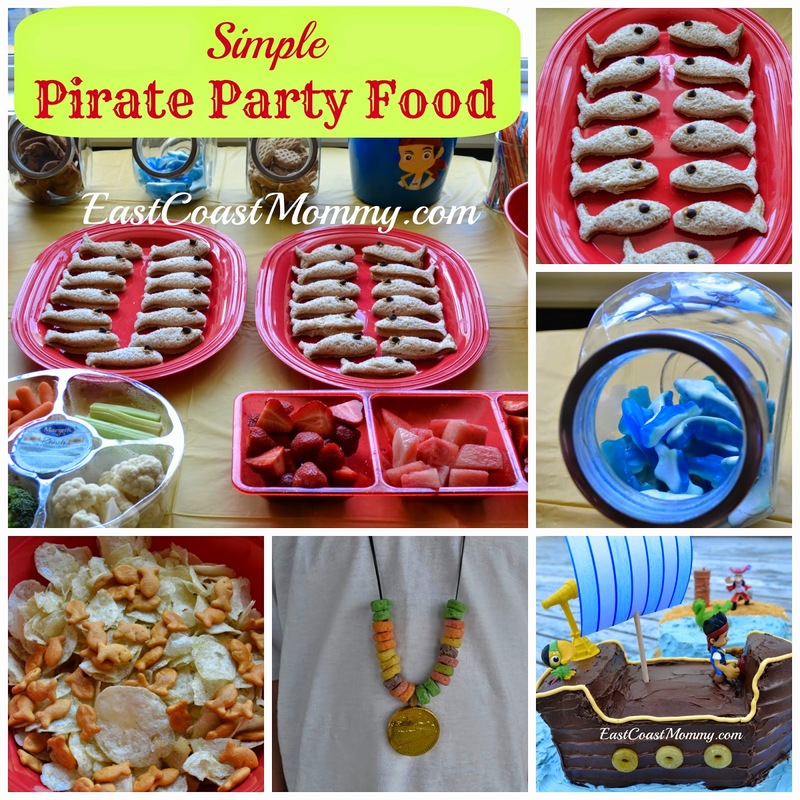 The guests were served a variety of food and snacks that fit with our pirate theme. You can find all the details of our pirate fare here. 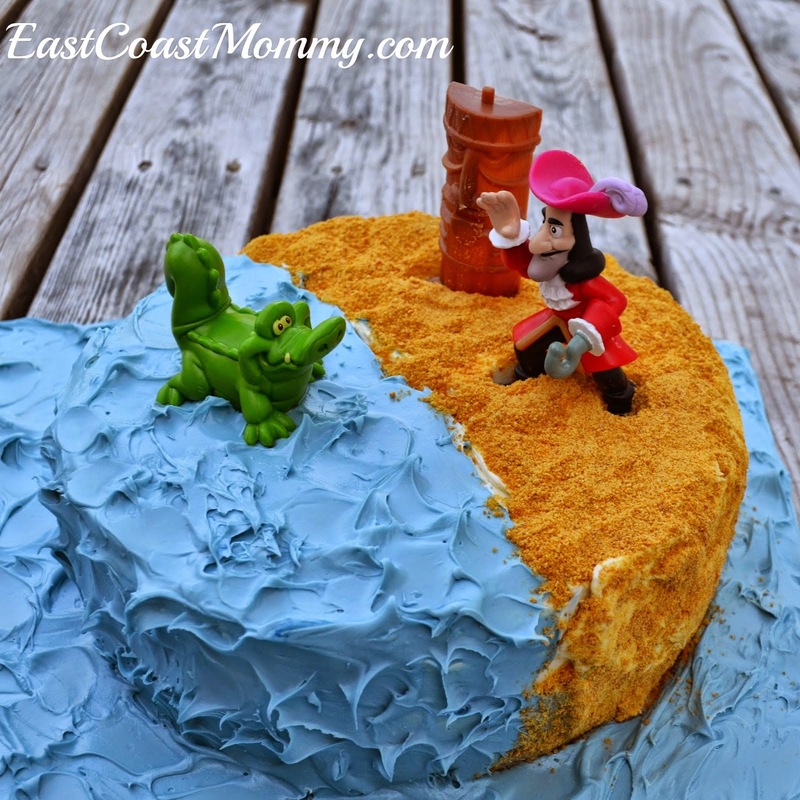 And, of course, our Jake and the Neverland Pirate cake was a hit with our pint-sized pirate guests. You can find out how I made this cake (from a mix) using the step-by-step tutorial you can find here. 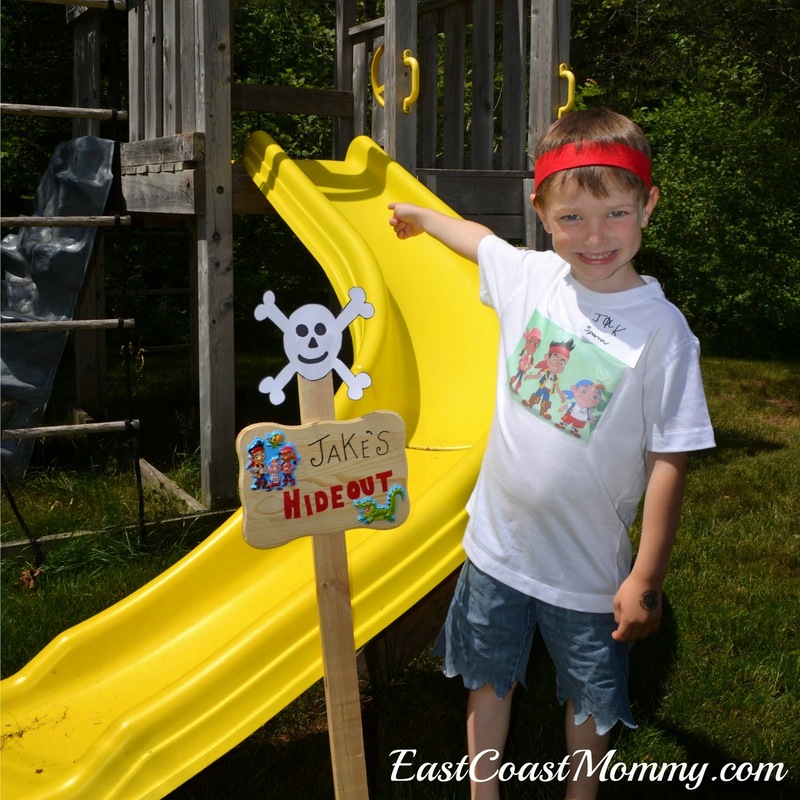 Of course, we also had a bunch of pirate games & activities to keep my son's friends entertained and happy. 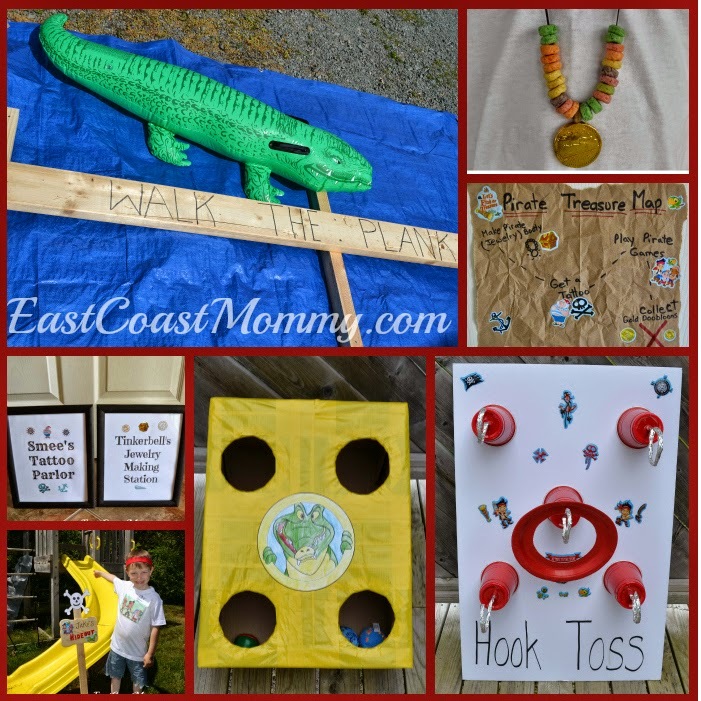 We had a plank, a hook toss, a treasure hunt, and more. You can get all the game and activity details here. Then, at the end of the party, each of our guests left with their headband, pirate hook, pixie dust, and a little "pirate booty" loot bag. You can download your own free, printable "pirate booty" tags here. 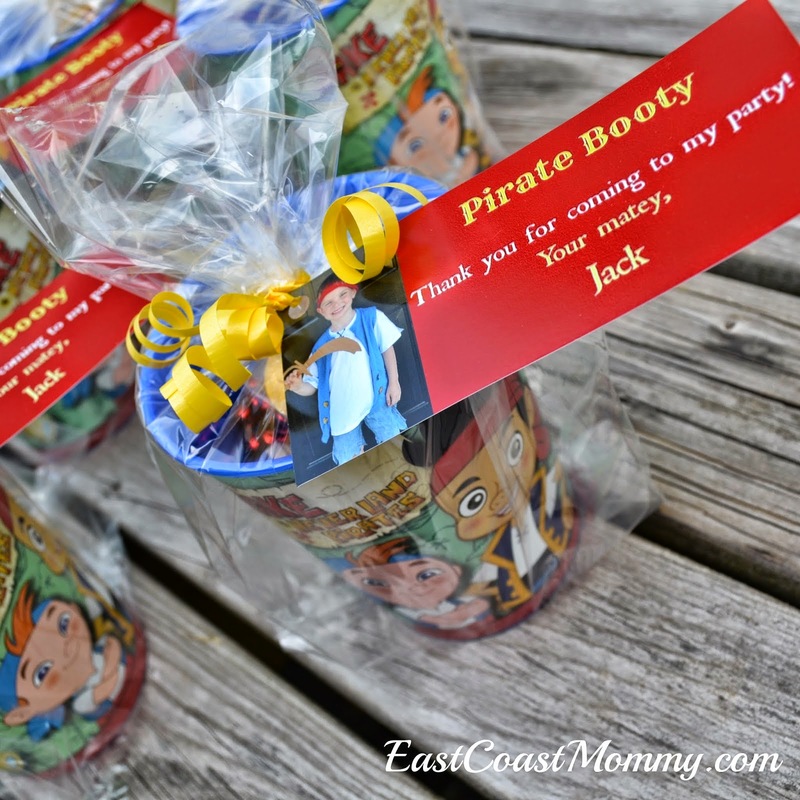 I loved all the little DIY details of this Jake and the Neverland Pirates party. 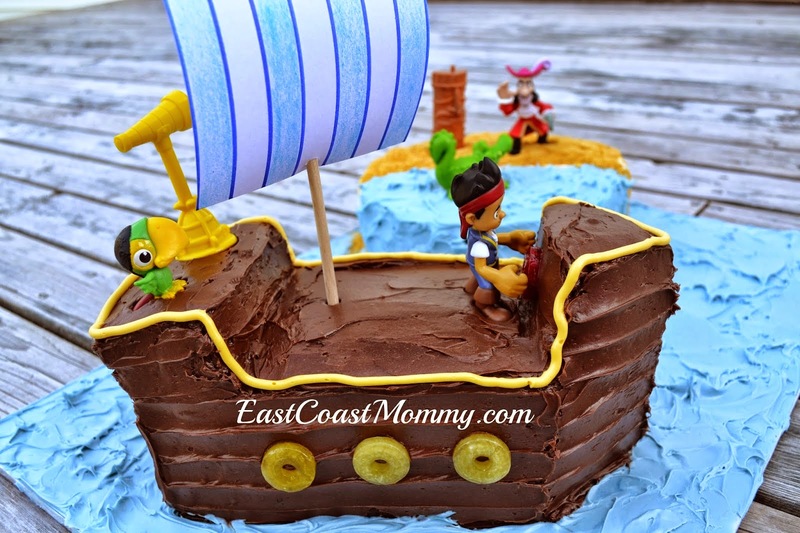 I hope you ARRRRR inspired to host your own DIY pirate party. 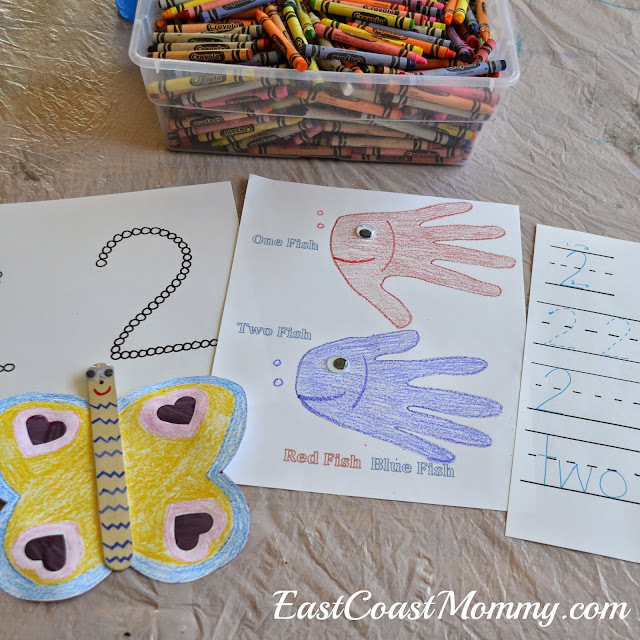 It really is a fun theme, and there countless opportunities to add special DIY details. The key to a successful party is a fun theme and a variety of awesome party games and activities. 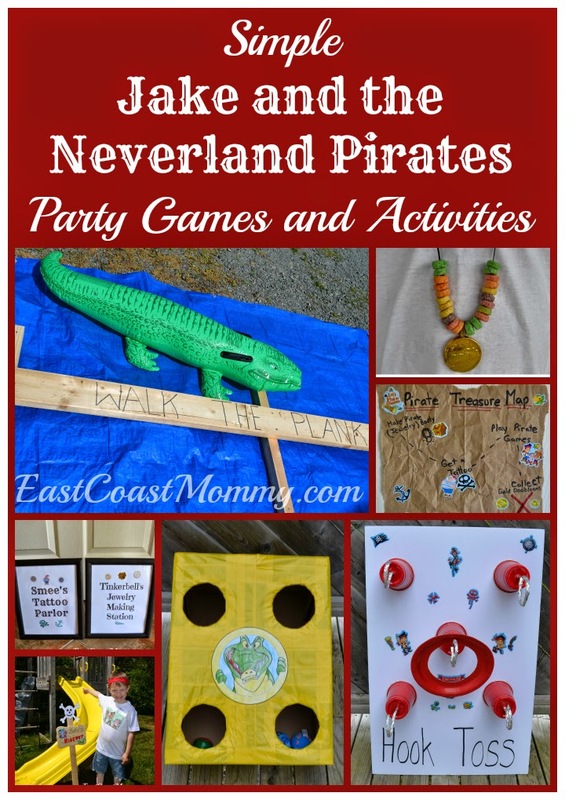 Today, I am sharing the fabulous games and activities that entertained all the little pirate party guests at my son's 5th "Jake and the Neverland Pirates" party. 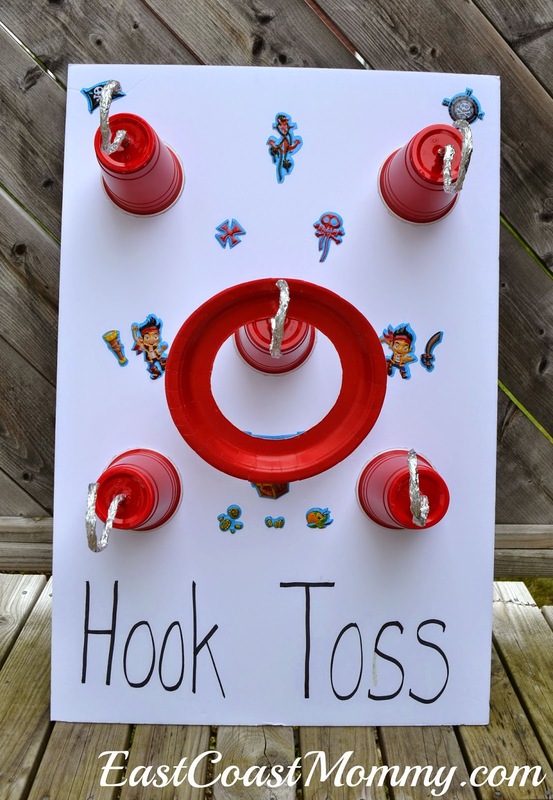 DIY Hook Toss - I made a really fun ring toss using dollar store supplies. I made some pirate hooks (using the tutorial you can find here), and then I used hot glue to attach them to a piece of foam core that I decorated with stickers. Then, I created rings by cutting the centres out of paper plates. 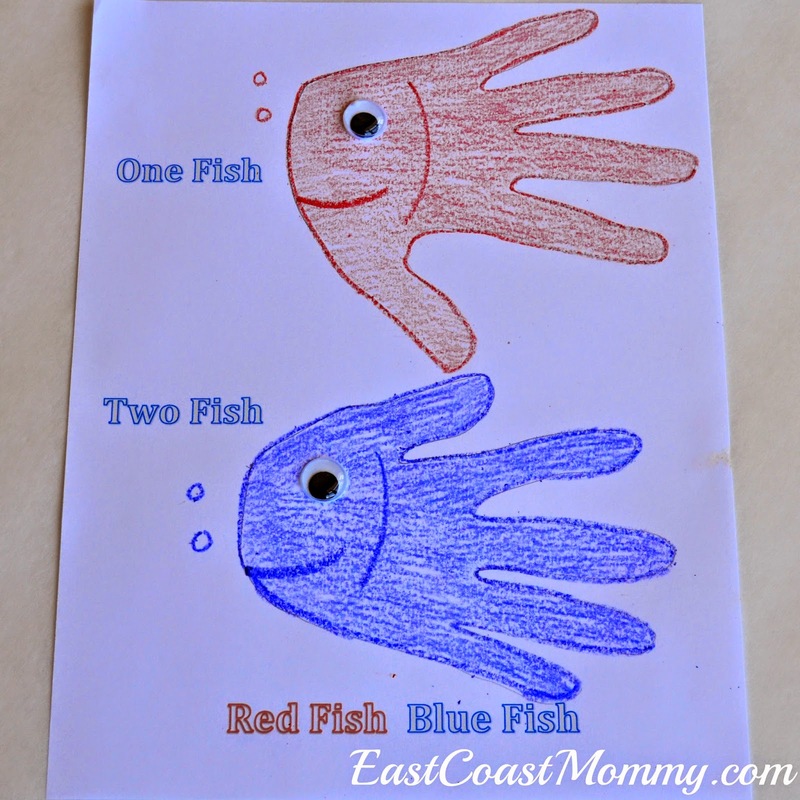 The result was an easy and inexpensive "hook toss". Bean Bag Toss - I cut four holes in a box, covered it in duct tape and added a picture that my son colored. 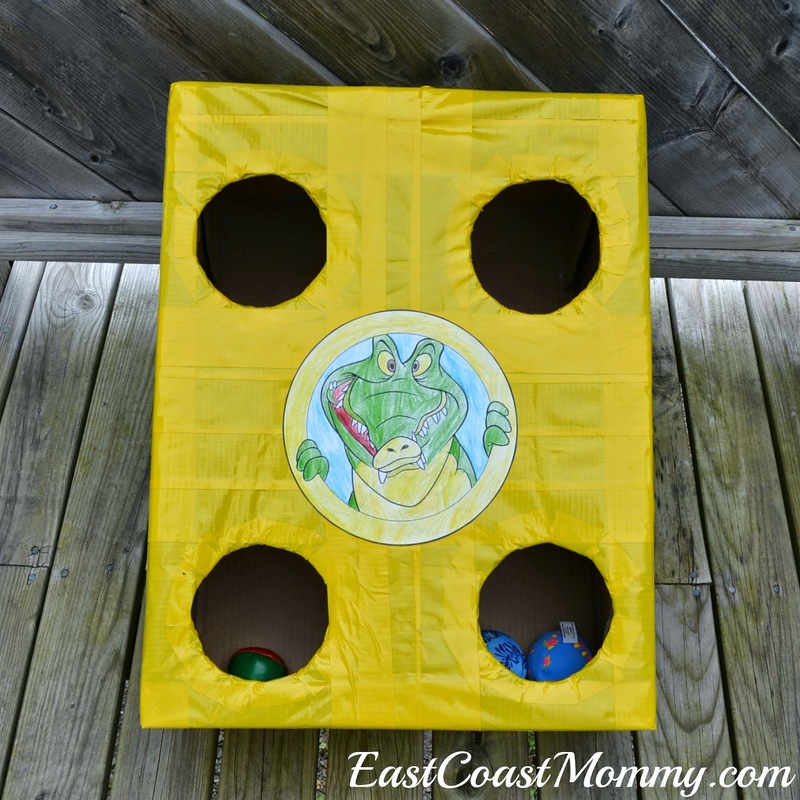 It's a simple way to create an adorable bean bag toss. You can find a full tutorial here. Walk the Plank - I nailed a few pieces of wood together to create a "plank" and placed it in water (i.e. on top of a blue tarp). Then, I added a blow up crocodile from the dollar store. 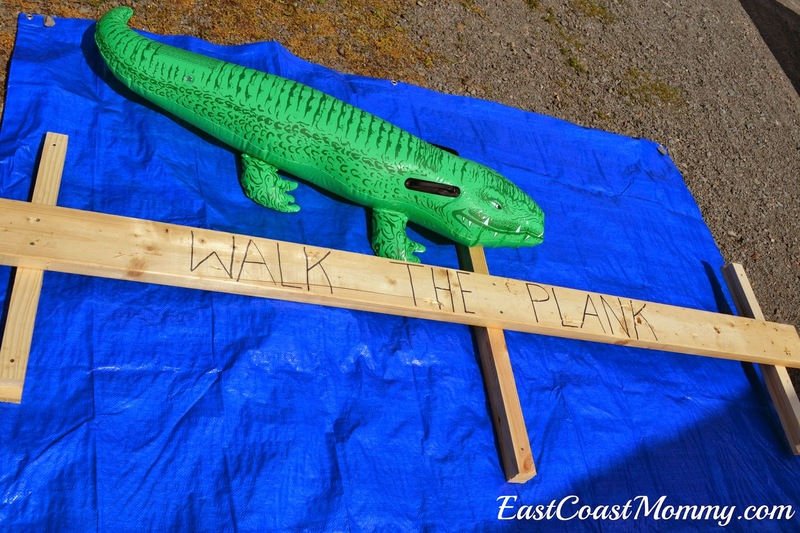 "Walking the plank" was a big hit with the kids at the party. 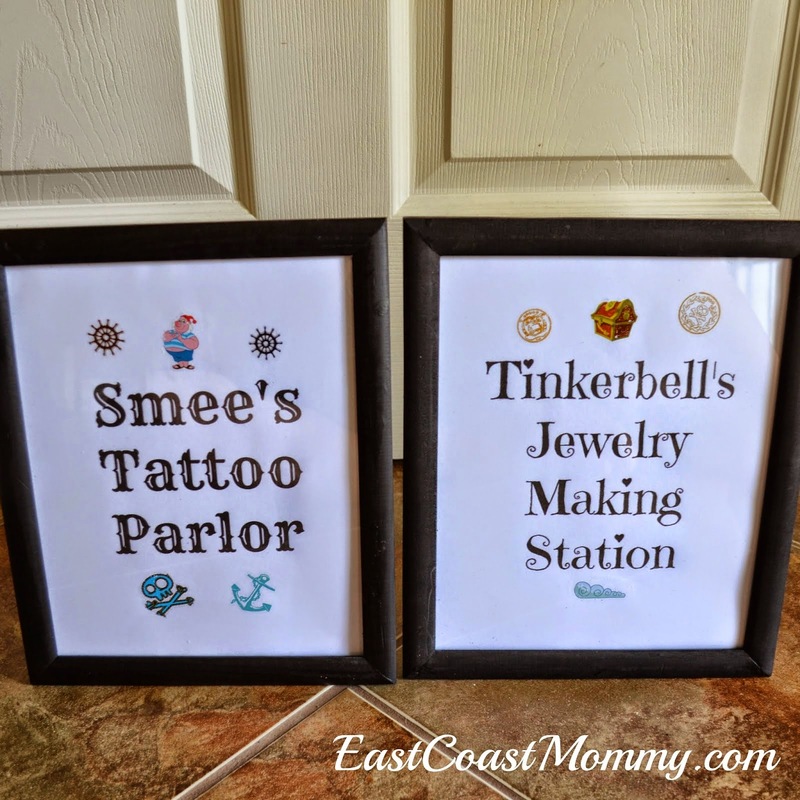 Tattoo Parlor - I bought some dollar store tattoos, and used them to create "Smee's" tattoo parlor. 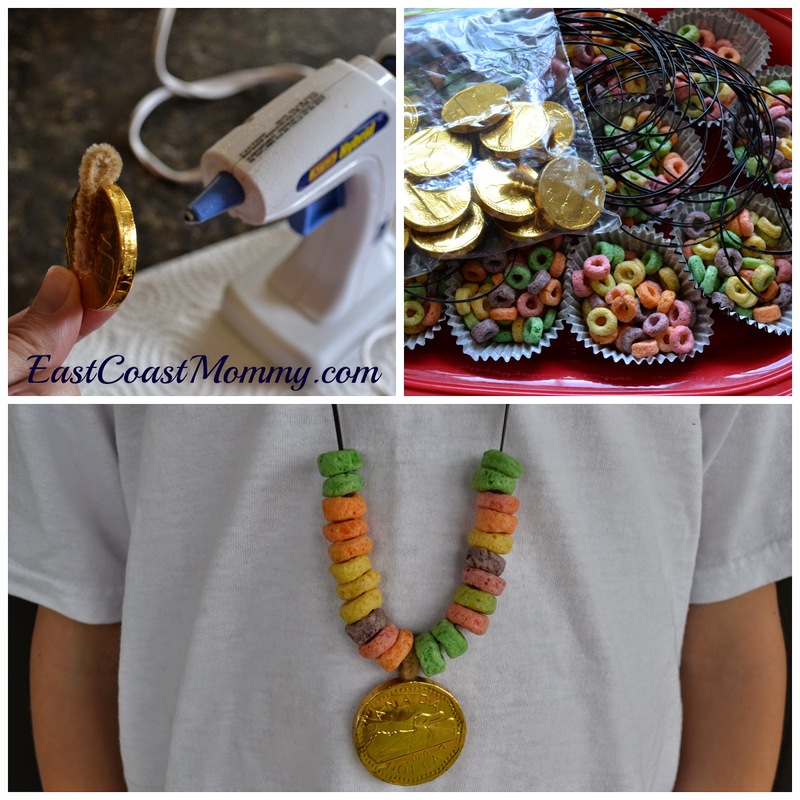 Make a necklace/ Pirate Treasure - I set up a station for the kids to make their own edible necklaces/ pirate treasures. They strung Froot Loops onto cording and added a chocolate coin charm (which I created by gluing a bit of pipe cleaner to the coin). 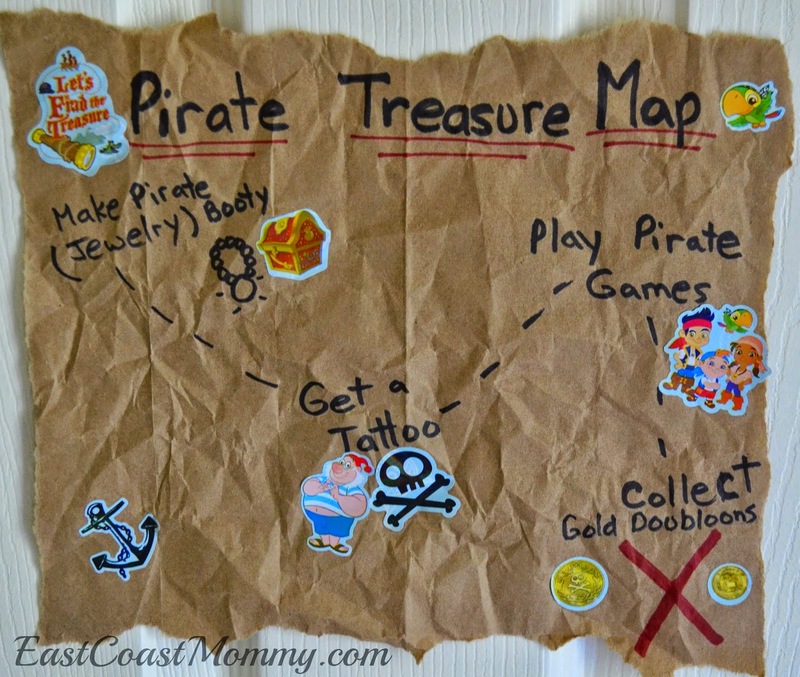 Treasure Hunt - Every pirate party needs a pirate treasure hunt, and we did ours by following clues to the "Team Treasure Chest". a) To find a treasure that you'll like, go and look for a purple bike. b) Great job finding the first clue. Look by the hose to see what to do. c) Next, we won't go far you see. You'll find a clue attached to a tree. d) Keep on going. You are almost there. Take a look under the porch chair. e) Here's a place you'll want to check. There's a clue under the deck. f) This is it. There is no doubt. You'll find a treasure in Jake's hideout. The kids had a great time running around the yard, playing games, and hunting for treasure. 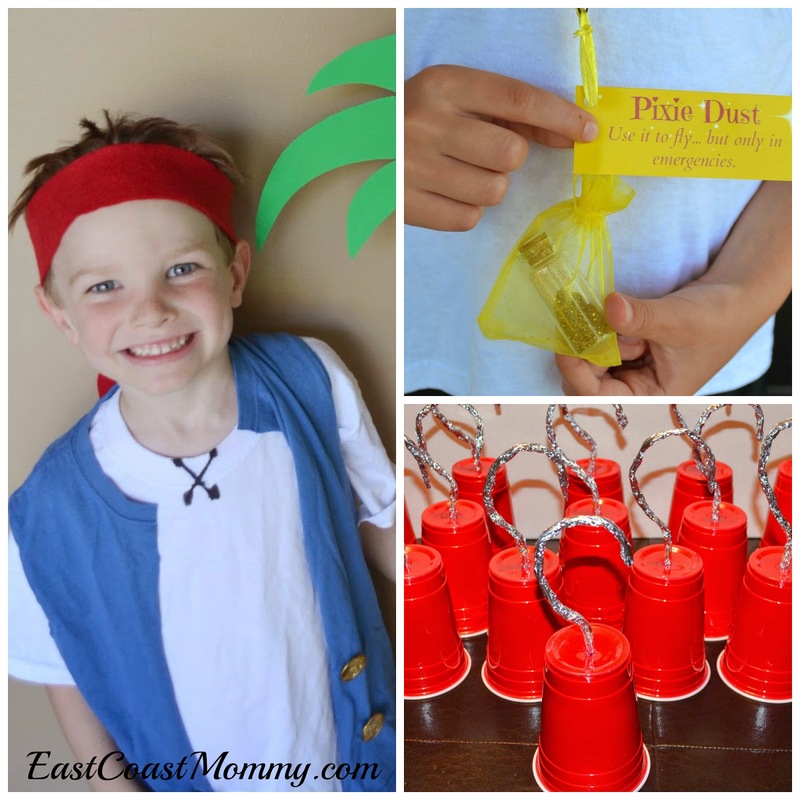 I think these easy pirate party games and activities are perfect for a Jake and the Neverland Pirates party, don't you?